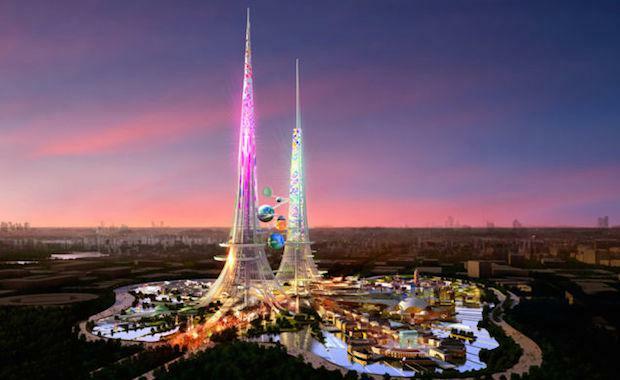 Plans for the world's tallest tower to be built in the capital of Hubei province in central China have been revealed. The Phoenix Towers, designed by UK-based Chetwoods Architects in partnership with HuaYan Group, will see the largest of the two towers sore at the height of one kilometre making it the tallest in the world if completed on schedule in 2017/2018. The taller tower, Feng will have about 100 floors for residential living, offices and retail space. The slightly smaller Huang tower will contain the world's tallest garden. The pink towers have been designed to represent the Chinese phoenix bird, with large spheres containing celestial-themed restaurants, skywalks and the world's tallest kaleidoscope driven by a wind turbine. The towers will incorporate green energy technologies such as pollution-absorbing surfaces to filter the city's air as well as technology to aerate and filter the water. The towers have also been designed to generate power to fulfil their needs as well as the neighbouring areas. The project is still awaiting final government approval.